It’s June already and the mango season is coming to an end here in India. While most welcome the monsoon showers that bring welcome relief from the scorching Indian summers, I almost mourn the passing of the hot summer. Like my friend Preethi says: the only soul to regret the passing of hot hot summer days! I absolutely adore mangoes, both ripe and raw. I cook mostly with raw mangoes and eat ripe mangoes as they are. And I feel really bad to bid adieu to the mango season. Each year I eagerly wait for the summer season to arrive, only for the mangoes to emerge out of their hiding! My grandmother learned to make this chutney from her maternal aunt Vimla, before she got married. That makes this a 60-year-old recipe. It’s spicy and sweet at the same time, getting the perfect tang from the sourness of the raw mango. Everyone in my family has a favourite way of eating this chutney. My cousin Vedika loves this spread over a layer of butter over warm toasts. It can be eaten with roti, parathas and chapatis and used as a dip with fresh cut vegetables or as a filling in sandwiches. 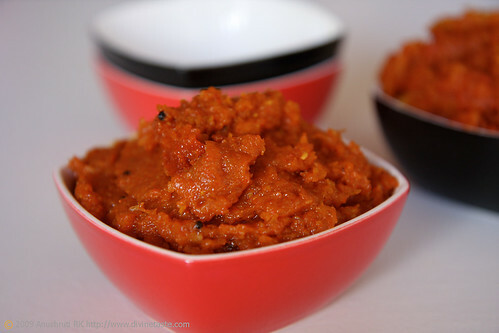 You can make this chutney with grated raw mango or ground raw mango. Although the texture is different, the taste remains the same. In a food processor or blender grind the raw mangoes for a couple of minutes. There is no need to add water as mangoes have lot of water inside them. In a wok or kadhai, heat the oil over a medium flame. Stir in the mustard seeds and when they splatter reduce the flame and add the asafetida, turmeric and methi powder. Stir in the raw mangoes quickly to prevent the browning of the spices. Put in the jaggery, red chilli powder and salt. Cook over a medium flame for about 8 to 10 minutes, stirring in between to prevent the blackening and the sticking of mango mixture to the vessel. Cool and serve as desired. *Roast the fenugreek seeds in a small wok over a low flame until it acquires a beautiful brown colour and emits a wonderful aroma. Be careful not to blacken the spice or else it turns bitter. In a coffee mill, grind to a fine powder. *Use whole fenugreek seeds and put it directly into the seasoning, if you do not have the time or inclination to grind them into a powder. Can be stored for 2 weeks in the refrigerator. Mango pickle looks mouth watering, miss them having on the beach in bombay, thanks for visiting my blog, you have been to basel? 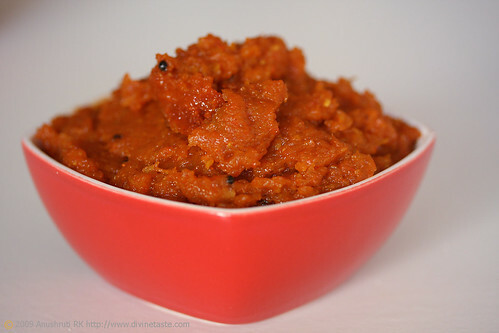 Hot spicy mango chutney with curd rice….yummm…..how i wish i had a bowl of it here right now…. love the wok that you've used Anu, the non-stick one. Cooking it slowly on the stainless steel i think adds to the taste….i have one question, the mango in the wok looks 'stringy' but the ones in the bowl looks 'pulpy', i personally like it when it gets 'pulpy', does it turn that way automatically as you start cooking? This is a great recipe, I have the ingredients and will give it ago. The colour is so rich and vibrant and I like the idea of using it as a spread, perhaps even using it like pesto with pasta ? 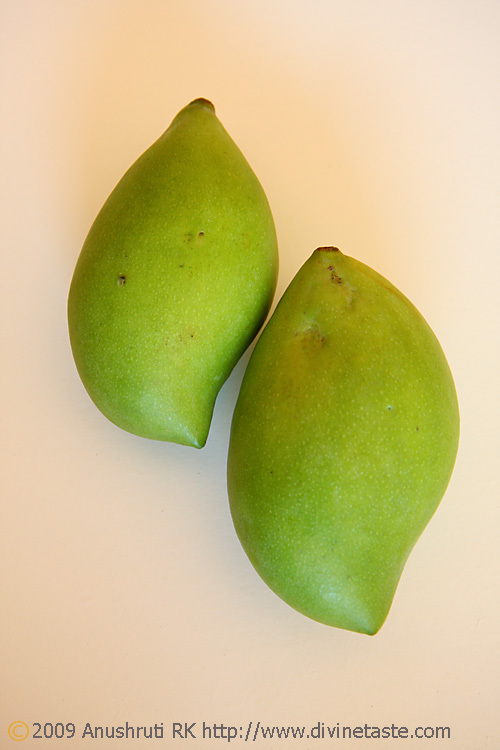 Simi: Our mother and grandmother use totapuri or sundarshree mangoes. You can use any raw mangoes that are not very sour. Parita: I just missed going to Basel when I was in Switzerland last year. Hopefully next time ill be able to visit beautiful Basel. Rustoo: Yes…crazy is the right word! Preethi: Its not non-stick..its just a simple steel wok. If you read the recipe given below you will understand that this chutney can be made both with grated mango and ground mango. Both the versions were made for divinetaste. The main picture shows the ground mango while the bowl in the background holds the grated version, the one cooked in the wok. Kiran: I'm personally not a fan of fusion cuisine, but your idea seems exciting. If you do try it, let me know how it tastes. 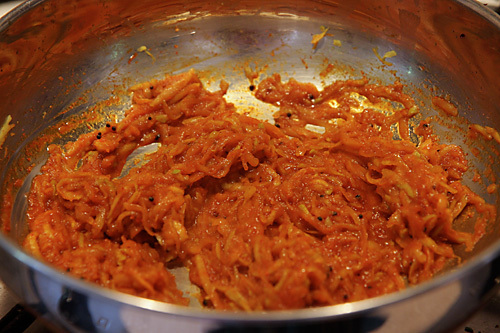 Call it a coincidence (not completely), but we made some raw mango thokku for tonight's dinner. It was the spicy version and would like to give this sweet variety a try sometime. Der Blog gefällt mir sehr gut. Viele Grüße aus Karlsruhe…. Thank you for sharing this recipe! This is exactly what I wanted to use to cook my chicken this night. I love spicy foods, but my hubby does not… so I will make plain chicken and use this as a dip!